It's SimCity in Minecraft. Literally. You're the mayor, there's an advisor, and you control your very own city. It's SimCity. 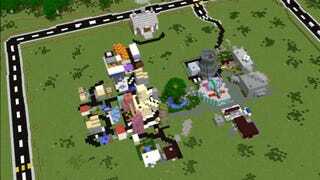 And notably, it doesn't require any mods to work: the map's systems are powered by vanilla Minecraft scripts, so Simburbia can be downloaded and installed just as easily as any other user-made map—though it does require the 1.8 pre-release version to run. Basically, what you get is a smaller-scale, first-person version of SimCity: a city simulation that keeps track of money and population, where you need to keep your citizens happy as you slowly expand your town, trying to avoid bankruptcy, defending as well as you can against disasters, and taking on sidequests from your citizens. If you want to give Simburbia a spin, take a look at the download page here.